David Carmon’s nightmare began while working in his yard Labor Day Weekend 2018 with a bite from a mosquito infected with West Nile Virus. Three days later, he was in the emergency room as his body slowly began to shut down. By day 5, his was paralyzed, on a respirator, and fighting for his life in the Intensive Care Unit at the Northeast Georgia Medical Center. 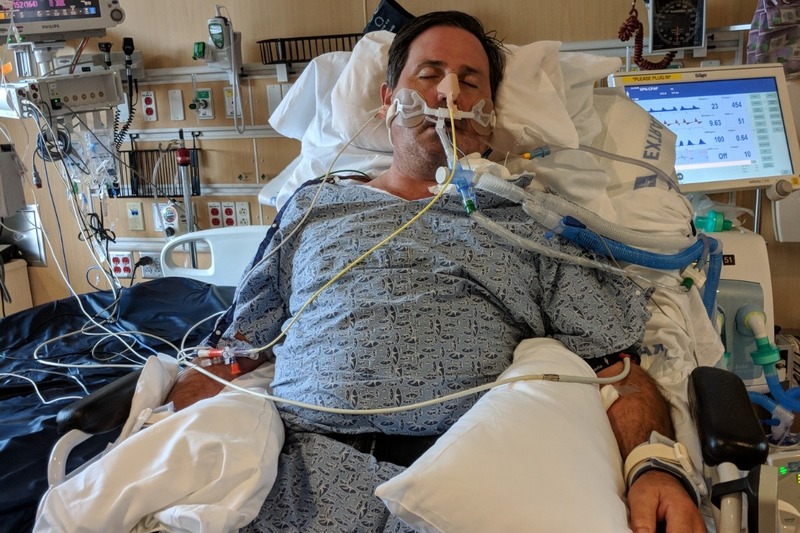 After days of no diagnosis and not knowing what was wrong, his family received the heartbreaking news that David had contracted West Nile Virus and as a result, a condition similar to Guillain-Barre Syndrome which attacks the nervous system. His prognosis was months of hospitalization and a recovery that could take up to a year or more. He received a tracheostomy and a feeding tube. After 4 weeks in ICU and life-saving treatments, David’s condition began to stabilize. Fortunately, he was referred to and accepted at the Shepherd Center in Atlanta. David was then transferred via ambulance for continued acute medical care and the beginning of rehabilitation for which the Shepherd Center is legendary. After 3 months of intense physical, occupational and speech therapy at the Shepherd Center, David is being discharged and coming home to a long and arduous recovery ahead. Ahead of his release, he is showing slight yet important signs of recovery. While confined to a hospital bed, a team of technicians use a lift to move him to a specialized wheelchair that he controls with the movement of two fingers on his right hand. David has regained some movement in his legs, yet he is months away from the hope of taking steps on his own. While there are small signs of nerves twitching in his arms, they remain completely immobile. David now speaks through a valve on his tracheostomy and is being weaned from the respirator that is on hand to breathe for his weakened lungs when necessary. Throughout his ordeal, David still has his faith, his humor, his brilliant mind and his sweet disposition. He is not giving up and is fighting hard every day to return to a normal life and the people who love him. 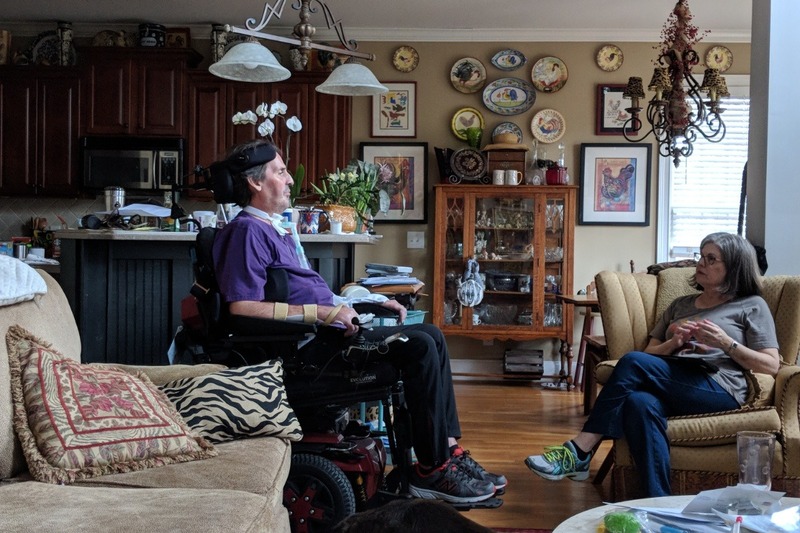 The harsh reality of David’s return home will be the need for specialized, skilled nursing care 24 hours a day, seven days a week in order to keep him alive and on the road to recovery. For the foreseeable future, David will remain confined to a hospital bed and wheel chair. With no use of his arms, he will be dependent for every aspect of his daily life. With his respiratory issues and complete immobility, David must never be alone. The cost of caregivers and therapy could reach more $25,000 a month. 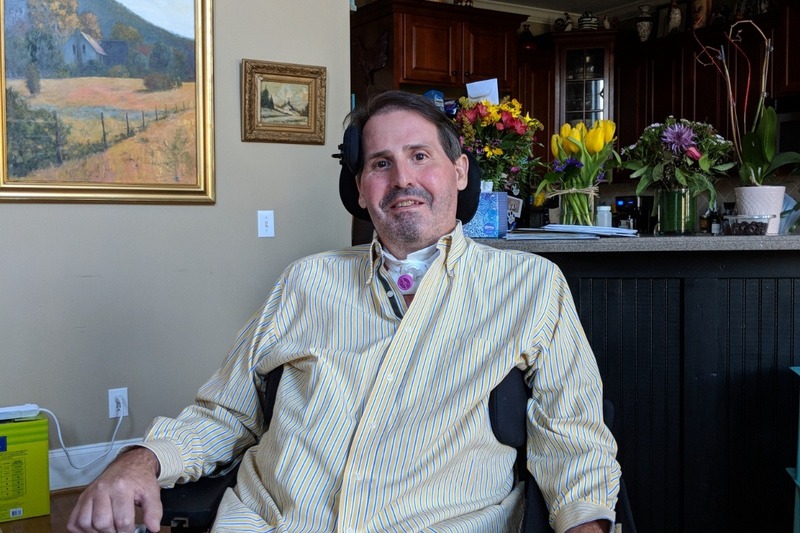 David will need a van specially equipped to transport him to therapy, a back-up manual wheelchair, a special chair for bathing and modification to our home none of which are covered by insurance. There will also be medical bills and other expenses we have yet to imagine. With the right care and your support, David can continue on his journey to recovery. He will walk again. He will breathe on his own again. He will hold his first grandchild to be born in June. Join us in our fight for David. Consider a donation and please help spread the word. David and I are so happy to be home! It has now been a little over 2 months. David still has round the clock care from nurses and caregivers. Insurance does not pay for any of that. He cannot be alone at all since he still has his tracheostomy and cannot do anything for himself yet. Lots of things have changed, however. David is getting stronger, so he graduated from in home therapy and began outpatient OT and PT a couple of weeks ago. That is going really well. Unfortunately, insurance will run out on that very soon. There’s lots of good news. They are working on him standing up. This is still very difficult due to great atrophy, and his left leg is just so very weak. He cannot hold his head straight up, so that makes it hard to balance. With great assistance, he took 15 steps! His arm muscles are firing FINALLY! He is able to move them when they put his arms in a zero gravity position. David has gained a great deal of weight now, so the tube feeding has stopped. He is able to eat most regular food until his jaws get too tired and just quit. David has been staying off the ventilator up to 18 hours now. His lungs seem to be getting stronger. Praise the Lord!!! The doctors and therapists have all encouraged us to get out of the house and do “normal” things so that he feels humanized. We do our best to go out to eat or go downtown for a stroll on the weekends. Sunday we went to church and to lunch with family. It was wonderful! We don’t want the confinement at home to make him more frustrated. David continues to have an amazingly positive attitude and wonderful sense of humor. He makes everyone laugh. He and I often speak about how truly grateful and blessed we are. It’s hard to describe how humbling it is to have such incredible support from our community. Thank all of you for your amazing gifts and prayers. This is going to be a very long journey.